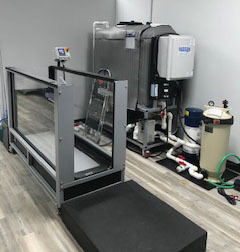 Colorado Center for Animal Pain Management & Rehabilitation (CCAPM), located in Westminster, Colorado, added an AquaPaws Jr. underwater treadmill by Hudson Aquatic Systems in April 2018, after deciding to add hydrotherapy to their multi-modal approach. CCAPM believes their pain management guidelines and approach is effective in improving the recovery process, reducing stress and increasing a sense of well-being… ultimately helping animals live longer. Rob Landry DVM, DAIPM, CVA, CCRP, CNPM, owner of CCAPM, said that offering hydrotherapy is one of the ways CCAPM improves both neuromuscular deficits and musculoskeletal limitations, and utilizes the AquaPaws Jr. underwater treadmill 5-10 times a week with sessions focusing on strength and conditioning for rehabilitation. Patients with an injury or disability related to orthopedic, neuromuscular, post-operative, and/or weight issues all benefit from hydrotherapy at CCAPM. The AquaPaws Jr. is designed to fit into spaces as small as 8’x10’ and can be placed in three different configurations to best optimize any space. Dr. Landry said that the small footprint of the unit, while still maintaining high quality hydrotherapy, was a major selling point for CCAPM.